If you’ve read my Anti-diet Project post, you probably remember that one of my objectives was to drink more water (right there with my pledge to switch to kale crisps and my decision not to give up chocolate!). Drinking enough water is something I’ve always struggled with. Simply because I wouldn’t think about it. Then I would get really thirsty (which is not a good thing, as it means you’re already de-hydrated) and only THEN would I drink water. But in the last few months, I’ve FINALLY cracked it and found a way to make it work for me. All it took in the end were those three little tricks. 1. Get reminded: As I just said, my main issue with drinking water was that I wouldn’t think about it by myself. So I did what every sensible person would do and look for an app that would do that for me. My favourite is Water Your Body. It’s so simple to use: When you first log in, you need to enter in your weight and the app will automatically set up a target for you to reach daily. Then all you have to do is add in how much water you drink as and when you do (which you can do in just two taps). I found this app super useful to get me started on my new habit: it keeps reminding you to drink water, so you don’t have to think about it yourself, and you create a habit of it without even realising it. Of course people might look at you a bit weirdly the first time you tell them your phone is telling you to drink, but eh, I now reach my target everyday without having to be reminded, so it’s well worth it! Water Your Body is a free app available on iPhone and Android. 3. Citrus hot water: Another thing that was difficult for me was to drink anything at all in the morning. I always felt water tasted funny, and tea didn’t seem to do much better on an empty stomach. Not that long ago, I read somewhere that a lot of people found hot water with a squeeze of lemon juice So I gave it a go, and it’s working like a charm. Do you struggle to drink enough water? Or have you found some helpful tricks along the way? A friend of mine had been visiting and was more than a little bit into Spanish food as she was just back from a work-trip to sunny Spain. So, where to head but to Brindisa, one of London’s top players in terms of Spanish food? We also got a plate of charcuterie (which I don’t have any picture of as I was far too busy fighting for the last slice of chorizo… very un-British of me, I know! ), along with some patatas bravas. The charcuterie was absolutely top-notch, with decadent amounts of fat running through it and excellent value at £12 for a massive plate (it was enough for 5 people to feast on without any of us fighting too much for the last bits!). We added in some veggies with sauteed broccoli (meh) and this little wonder: Spinach, raisins & pine nuts. I wouldn’t have bet on raisins with spinach, but I was quite wrong there and will be trying to make some version of this dish very soon (I’m thinking cranberries…)! Then came some sliiiiiiightly naughtier vegetables in the form of Berenjenas Fritas (that is fried aubergine with chesnut honey and pine nuts, for those of you who speak Spanish as well as I do!). And yet, they ARE as lush and delicious as they look, thanks to very thin batter and all that glistening honey! After a lot of negociation, I managed to convince my friends that ordering the Galician-style octopus was a good move. I might have been a bit over-enthusiastic though, as it was a nice dish, but not as life-changing as I would have expected it to be. However, the salsa verde was a nice addition and helped lifting up the dish and making it fresher than it usually is. And that smoked paprika? Oh my. I need to get my hands on a box of that magic spice when I next go to the Borough Market! (Brindisa has a store there, where you can buy any- and everything you need to cook up a Spanish feast at home!). Last but not least, we got some Croquetas del Dia (gooey little balls of happiness, as far as I’m concerned, which I have no picture of for obvious reasons. aka I was putting my mouth on fire to eat my fair share when it was still hot!) and Grilled chorizo on toast, which was every bit as good as the one they serve in rolls at their Borough market stall, and gone far too quickly! Add to all of this delicousness the fact that the staff was lovely (and a few more jugs of that excellent sangria), and I’ll leave smilling from ear to ear (and very full). Which is pretty much what happened at Brindisa. My 10 beauty favourites of all time. When it comes to beauty products, I am very much a creature of habit. Many because my skin has a bit of a temper and strongly reacts ever single time I try out something new (until it gets used to it, that is). So I almost never get around to try new things, unless some of my favourites get discontinued (end of the world). I would be the worst beauty blogger ever. 1. Eau de Parfum, Chloé: I fell in love 5 years ago, when I was looking for a “signature” scent. My skin being acidic, a lot of perfumes don’t stay on me/ start smelling funny after a few minutes (sexyyy!). But not this one, thanks god! 2. Moisture-rich Body Lotion, Clarins: Rich but gets absorbed SO quickly and doesn’t leave your skin sticky/oily. THE most decadent body moisturizer ever. It doesn’t come cheap, but is worth every penny. 4. Exfoliating gel, Lexel Paris: THE BEST exfoliating gel I have EVER tried. And I’ve tried A LOT. And it smells DIVINELY good. The only issue being that it’s quite difficult to find on this side of the Chanel. 6. Make Up Remover Oil, Mixa: I’ve never really liked water cleasing lotions (is it just me or do other people feel like their skin is left weirdly sticky? ), and since I wear waterproof mascara (see above), oil makes a lot more sense for me anyway. I love this one because it smells so nice (a rose-y sort of thing), but it’s not sold in the UK, so I’m probably going to try out the L’Occitane one once I finish my stocks. 7. Vinosource Moisturizing Sorbet, Caudalie: The only face moisturizer that doesn’t turn my combination skin into a complete mess. The texture is somewhat odd (more like a serum than a moisturizer), but it works for me. 8. C me smile Lip Butter, Yes to Carrots: Everyone needs some lip balm in their life. I have tried many (I went through a lip balm collection phase at some point), but this is the one I’d buy immediately if I ever were to run out (not happening any time soon though!). 9. Sephora Twizzers: I can’t live without twizzers. So much so that when in my first year of uni, we had to bring along the one thing we couldn’t live without for one of my German conversation classes, I brought twizzers along. Back then, I had pink ones, but they died a tragic death. So I bought the exact same ones in yellow and now my life is back in track! 10. Stay Matte Powder, Rimmel: It keeps the skin perfectly matte for hours without having to worry about re-applying any. Oh, and it’s cheap as chips too (especially if like me, you take advantage of some crazy offers!). What are the beauty products you can’t live without? Anything I absolutely must try? Posters I’d love to take home, Chinese New Year, cocktails, quite a lot of London, my new babiiiiiies and much more on my Instagram. Want to know what you’re missing? Follow me! Can we take a few sec to celebrate the fact that Make Up Forever NOW HAS STORES IN LONDON?!!! I truly relate to Miho’s article on being an introvert. 5 disposable objects to ditch from your life. Truly inspiring! A really cool art project on the expectations of beauty! Could this be the solution to night time at 3:30? People with seasonal affective disorder, rejoice! Love The Glitter Guide’s to healthier mornings. I can’t quite say I’m usually one to pursue the latest food-trend (or superfood, for that matter). Proof is, I only had kale for the first time in September (and I’m pretty sure by then, it wasn’t trendy anymore!). The first time I heard of chia seeds, I was absolutely sure I wouldn’t like them. Sure, they were really good for you, with all their anti-oxydants, fibers, protein, and all, but they were always described as jelly-like, which is a texture I really couldn’t care less about (unless we’re talking about panna cotta, obviously). But then they started popping up regularly on my favourite food blogs, and on Pinterest, and some of the things I was seeing were looking pretty good indeed. So I swallowed my pride (and crossed my fingers), headed to Whole Foods and got myself a box. I’ve been in love since then, and chia seeds have since been a regular feature in my breakfasts. 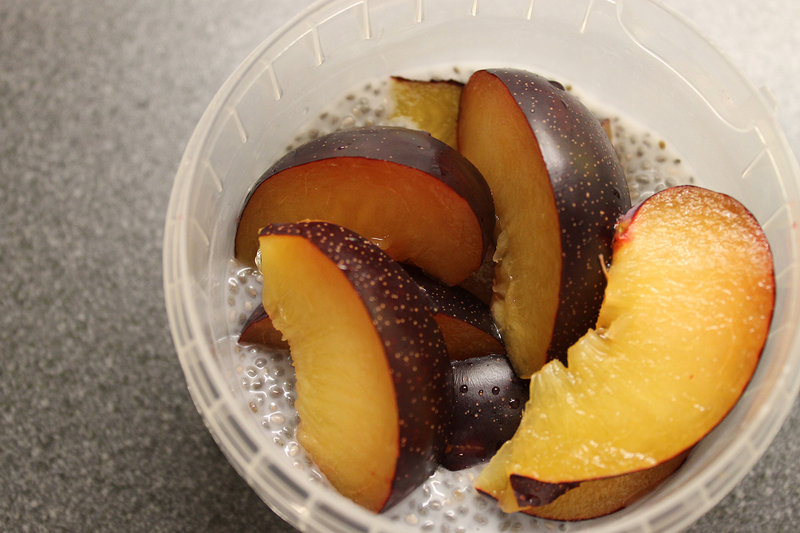 Mainly because chia seed pudding makes such a convenient, cheap, fast to prep and healthy on-the-go breakfast. Oh, and it’s vegan too… Ticks all the boxes for me! 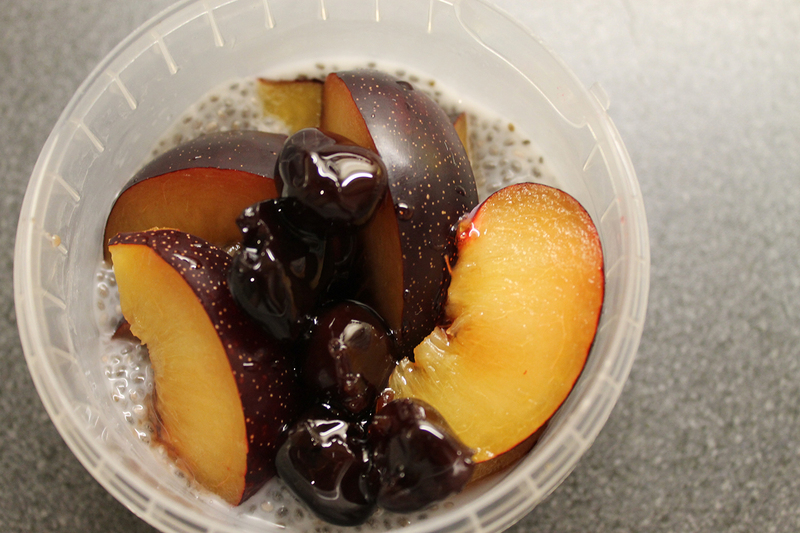 In a bowl or sealable container, combine the chia seeds and the “milk”. Stir and let to rest for a few minutes. When the mixture reaches a loose jelly-like texture, pile up fruit on top. You can try doing it neatly… But more often than not, I end up being quite messy! 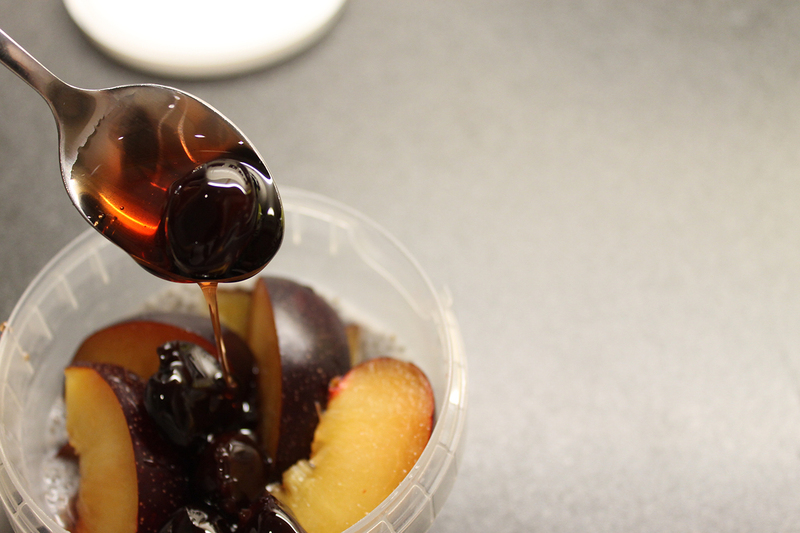 Add your syrup of choice (look at those glossy cherries!). Add one more, you deserve it! Eat immediately or cover and refrigerate until you’re ready to eat/leave for work! 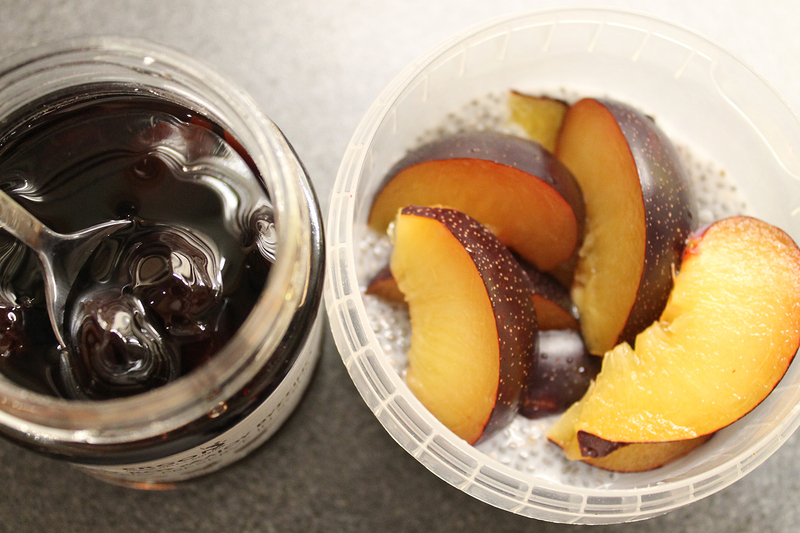 *a note on Ergon: if you’re ever looking for fantastic Greek groceries (or just those cherries! ), look no further. The little store in the basement of their restaurant is any foodie’s dream (if you go, you might as well take 5 minutes to have the cardamom panna cotta from the above restaurant. You won’t regret it). And they deliver too! See, I told you it was an easy and quick recipe! Have you tried chia seed? How do you use them? Cake, quotes, the cutest socks and much more on my Instagram. Want to know what you’re missing? Follow me! The best article I’ve read this week: Holding Hands with another man in public has made me realised how naive I’ve been about homophobia. Very inspired by a mid-week trip to Ottolenghi’s (and all the cakes!). The only question remaining is, WHERE do I find Al Yaman / Al Arz tahini in London? I knew I wanted to go to Hotbox. Now I simply need to! Thanks The Londoner for giving me yet more reasons to use to convince Mr.
And one more for the to-do list! Cravings: can your food control you at The Science Museum. Psyched. Have to try this out. NOW! Any innovation that’s providing a solution to food waste has my vote. Can’t wait for Pancakes’ Day. And I blame The Diner and its Reese’s peanut butter promises! You probably remember from my 2015 bucket-list article that one of my objectives for this year is to lose a bit of weight. I’ve had a bit of time to reflect on this since I wrote it and have come to the conclusion that what truly matters to me is not quite the numbers, rather the image I have and project of myself. It’s not as much about dropping a few pounds as it is about having a thinner-looking, stronger body. But I have no intention of giving up chocolate, thank you very much. Motivation: Even if I’m not one for drastic, quick changes, it is still important to me to be able to measure what is working and what isn’t. I don’t have weighting scales at home, nor am I really interested in investing in one. Instead, I’ll click before pics to compare myself towards, and take my measurement up. And then compare those up with the real me as time goes by. Plan ahead! I found out recently that if I write a list of ideas for meals over the weekend, and have all ingredients at hand before said week actually begins, it actually makes a difference in how motivated I am to cook healthy meals. The truth is, most of the time, I am too tired to improvise something when I come back from work, and even the idea of having to go to the supermarket on my way back home makes me craze burgers almost immediately. Same thing goes for lunch, if I don’t pack anything, I’ll either go hungry and eat everything I find when I get home, or grab something from the closest supermarket…. Portion control. For months, my boyfriend and I had regularly eaten dinner from the same plate. It’s very romantic and all, but the trouble is, I eat faster than he does, so more often than not, I ended up eating too much. So we’re changing back to eating from two separate plates so that I’m no longer a griddy little piggy winning about being stuffed at the end of each meal! Drink more water. I used to be really bad at this. I think I’ve finally cracked it. Will write about it soon. Create an exercise habit. Now, working out’s really not my thing. But I want to get into the habit of exercising 5 times a week. I’m currently trying a few things out and will let you know how they’re all working (and more importantly, if I miraculously managed to keep up with the habit!) in my next update. What are you doing to become/stay fit? I’d love to hear your tips!